The pilot of the tailwheel-equipped airplane reported that, during the landing roll, a wind gust picked up the left wing. The right main landing gear collapsed and the right wing impacted the ground. A review of recorded data from the automated weather observation station located on the airport reported that, about 12 minutes before the accident, the wind was from 360° at 6 knots. The airplane landed on runway 07. ORLANDO, Fla. (FOX 35 WOFL) - A small plane has crashed at the Orlando Executive Airport, confirms an official from the Greater Orlando Aviation Authority. The crash occurred just before noon. The plane involved was an experimental aircraft. 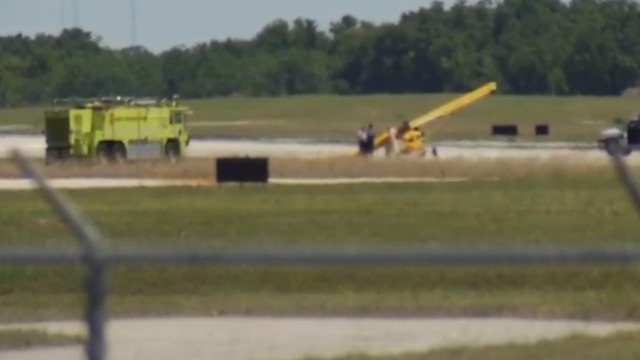 The Greater Orlando Aviation Authority says that the right main gear collapsed during landing on runway 7. One pilot was aboard and there were reportedly no injuries. The airport will reopen once the plane is towed off the runway.